Hoomanao means "to remember," and that's exactly what the organizers of this new Maui activity hope participants will do after experiencing its fascinating three-hour immersion into Hawaiian culture and history. Cost: $69 for adults, $49 for ages 12 and younger. Kamaaina rates are $45 and $44, respectively. Because this activity is held outdoors, dress comfortably (shorts and T-shirt are fine) and bring a hat, sunglasses and sunscreen. The memories begin with the setting. Conceived and presented by the talented team that stages the acclaimed Old Lahaina Luau, Hoomanao takes place in the calm of morning, in the picturesque oceanfront setting where the evening luau is held. Coconut palms, ti, hala (pandanus), monkeypod, plumeria, naupaka kahakai (a native shrub), lauae fern, red ginger and more adorn the grounds, and across the channel Lanai and Molokai float on a cushion of sparkling blue. Bring your appetite. A bountiful Hawaiian-style buffet offers hearty dishes such as kalua pork with lomi salmon, a local version of the classic corned beef hash; stuffed French toast, three layers of sweet bread filled with mango orange marmalade and dipped in egg batter; and haupia oatmeal, oats simmered in sweet coconut milk. Following breakfast and a performance of hula kahiko (ancient dance), you'll visit three stations or kulana, each focused on a different aspect of old Hawaii: hula, warfare and the ahupuaa (land division extending from the mountains to the sea). Demonstrations and hands-on activities enhance each 25-minute session. Keith Curimao, Kamuela Samudio and Sharise Abellineda participate in the warfare kulana. In the hula kulana, you'll learn that centuries ago, dances not only provided entertainment, they recorded genealogy, chronicled important events, and honored the gods and kings. Without a written language, early Hawaiians documented their lives in the chants and gestures of the hula. If you're game, you also can learn a few hula steps and play implements such as the puili (split bamboo rattle), ipu (hollowed-out gourd) and uliuli (feather-topped gourd rattle). In the warfare kulana, you'll discover how battle victories helped the alii (ruling class) gain land, power and prestige. Examine reproductions of newa and laua palau (clubs), leiomano (shark-tooth daggers), ihe (spears), maa (slingshots) and other weapons. You can try throwing an ihe -- not an easy task, you'll find, if you hope to achieve distance and accuracy. Warriors often were identified by elaborate tattoos of geometric figures and representations of their aumakua (personal gods), including the lizard, hawk or shark. In his authoritative book "Ka Poe Kahiko: The People of Old," esteemed Hawaiian scholar Samuel Kamakau noted that alii and high-ranking warriors sometimes were tattooed a solid black (kakau paele) all the way down their right side, from their head to their feet. Strict rituals accompanied the application of tattoos. Experts in the art pricked the skin using needles made from the beaks, bones and claws of birds, and the sharp barbs on the tails of certain fish, among them the palani, kala and pualu species of surgeonfish. The burned soot of the kukui nut made an indelible black ink. If you'd like to sport the distinctive tattoo of a warrior, your hosts at Hoomanao's warfare kulana can oblige. Don't worry; the striking tattoo image of shark's teeth encircling a honu (turtle) is quick and painless to apply and will wash off in a day or two. LONG AGO, communities were divided into ahupuaa, districts stretching from the uplands to the coast that were governed by the alii. These areas were so named because their boundaries were marked by a pile (ahu) of stones topped by the head of a pig (puaa). Villagers in the ahupuaa worked hard together, always displaying gratitude and respect for their precious natural resources, never taking more than they actually could use. Thus they were able to survive on the isolated Hawaiian islands for a thousand years before the first Westerners arrived. In Hoomanao's ahupuaa kulana, you'll discover how the early Hawaiians caught fish with nets thrown into the ocean, made tapa from the bark of the wauke (paper mulberry) tree and pounded the root of the taro plant into poi, a dietary staple. As with the other two stations, participation is encouraged. "One of the hosts demonstrates 'throwing net' in the water, then guests can try doing it themselves on land," says Kamuela Samudio, Hoomanao's operations manager. "They can pick up beaters and pound tapa and poi, and taste freshly made poi and poke (chunks of ahi seasoned with salt, seaweed and kukui nut relish). We also have fish and octopus lures on display. The lures are authentic reproductions, not museum artifacts, so guests can touch them and get a close look at how they were made." 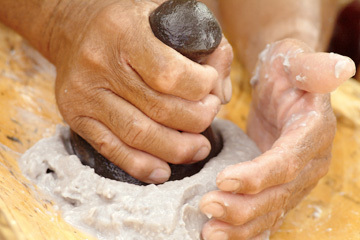 Portabes pounds steamed kalo into poi for guests to sample. 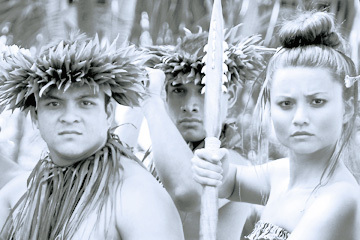 HOOMANAO evolved from Hawaiian cultural classes started for Old Lahaina Luau's employees. "The company hired respected kumu (teachers) to instruct the classes so that everyone would receive accurate information and be on the same page," explains Samudio. 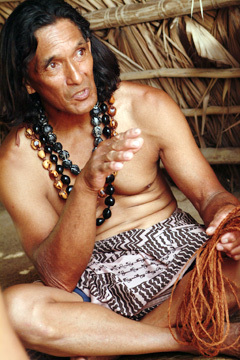 "For nearly a year, we attended weekly two-hour classes on hula, fishing techniques, fishnet and basket weaving, lei making, weapons, tool making, poi pounding, tapa beating, canoe paddling, and Hawaiian language and religion. "We learned what kinds of fish were caught off the coast of Lahaina and participated in a sham battle; we divided into two teams and threw padded spears at each another." Employees also went on excursions to places rich in history, such as Mokuula in Lahaina, a residence of the alii from ancient times through 1845, when Kamehameha III moved the capital of the kingdom to Honolulu. They learned this sacred site once encompassed an islet in the center of an 11-acre spring-fed wetland, including taro patches and fishponds. Now buried beneath a baseball field and parking lot, Mokuula is the focus of an ambitious preservation effort that aims to re-establish the wetland and royal hale (homes), and construct a cultural center depicting life in Hawaii prior to Western contact. These educational sessions were so successful that Lopaka Aguiar, co-owner of the Old Lahaina Luau; Jamie DeBrunner, corporate director of sales; and other staff members saw the potential in launching a similar educational program for visitors. "They realized it could be another way to share and perpetuate the Hawaiian culture," says Samudio. "It could be another option for Maui visitors looking for an authentic cultural experience." Response to Hoomanao, unveiled in July, has been enthusiastic. "Most people come not knowing anything about the Hawaiian culture, but once they get here they're totally blown away," says Samudio. "Even the young kids get really involved. "Recently, a couple from Los Angeles came to Hoomanao with their two sons, aged 6 and 4. When it was over, the boys asked, 'When can we come back?' They didn't want to leave." At first, company executives thought such young children wouldn't have the attention span to sit through Hoomanao's three information-packed presentations. "But," Samudio says, "the kids sit very quietly through the whole thing, discussions and all. They're excited about participating in the hands-on activities and are really tuned in to learning." According to Samudio, Hoomanao provides malihini (newcomers) and kamaaina (residents) with new insights into the Hawaiian culture and how it has shaped island life today.